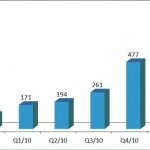 We saw tremendous growth in QR code usage in 2011. We have made some stats for the first half and 3rd quarter of 2011 and now we want to present you deeper statistics of overall usage of QR codes created with YouScan.me. 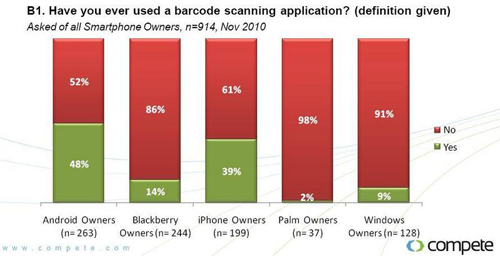 We saw an increase of 800% of QR codes scanned when comparing January 2011 and December 2011. Below is detailed data of all scans made through 2011. 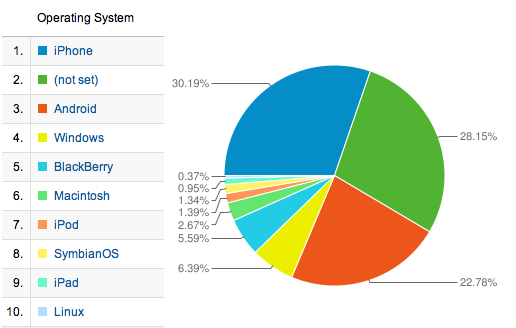 As you can see from the graph, the majority of scans come from iOS and Android devices. Scans made from iPhone hold the first place with 28.29%, second is Android holding 24.92%, followed by Windows Phones – 9.66% and BlackBerry phones – 5.66%. When counting the scans by OS we need to add iPods (1.78%) and iPads (0.83%) to the iOS numbers. When it comes to mobile device branding Apple holds the first place, followed by HTC, Samsung, RIM, Motorola, Sony Ericsson, LG and Nokia. I want to introduce you the latest of our constantly released new features. It lets you export stats data about your code in CSV format, so you can create graphs, analyze the scans and the behavior of users. In the CSV you get data about geography of the clicks ( all clicks made from its creation sorted by countries ) and scans by date, which is available for 1 month in the past from date you are exporting the CSV. So if you want fresh and overlapping stats to work with we suggest exporting your data at least once per month. In future we are planning to have more data you can export, like deeper geography of the scans, device with which scan is made and some more. 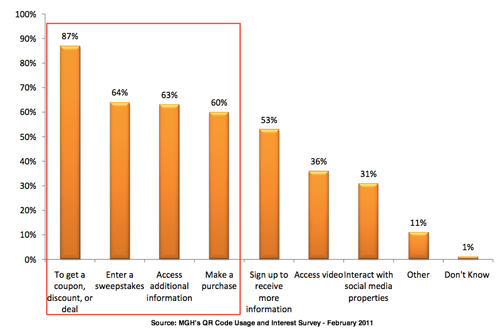 Here are some inside stats of QR code usage and penetration in world for Q3 2011. Since our last stats for the First half of 2011 we saw growth in both creation and scans of QR Codes. However we have some change in places when it comes to devices used to scan codes. 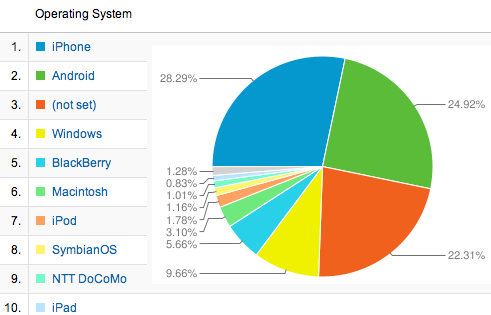 Last period Android phones lead iPhones with more than 8%, but now we have a different picture. In Q3 2011 iPhones are responsible for 30.19% of scans, with Androids responsible for 22.78%, which is a total game changer when we compare metrics from the last period and now. Here is some catch, so take a look at the graph and you will see a HUGE part of 28.15% of the scans which OS is marked as “not set”. From my experience and some research about Google Analytics i understood that these are mainly Android and Windows Phones so the final numbers will be different. We are devoted to give you all kind of statistics of QR code usage and penetration in world. We saw a tremendous growth in QR code usage in 1st quarter of 2011 since 2010 and now it is time to share some of our data for the first half of 2011. Here is info and charts of our data gathered since our launch in February till now. 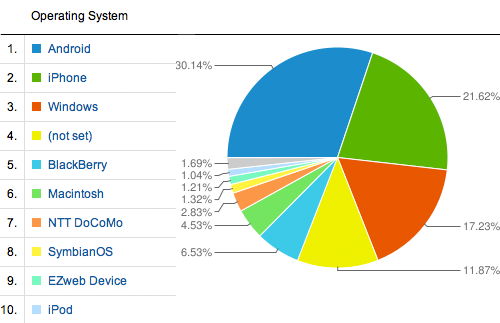 As you can see Android phones lead iPhone with 30.14% to 21.62% of the scans and following the iPhone closely are the Windows Mobile and Windows Phone 7 devices with 17.23%. 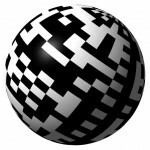 With about 70% of the scans from these operating systems it is clear to see what kind of people can be targeted to scan QR codes. Here is a report from 3GVision, the creator of i-nigma barcode scanner, which shows the worldwide growth in mobile barcode usage. The most important facts of the report is the worldwide exponential growth, with Q1/2011 growing by 61.9% over Q4/2010, and 451% over Q1/2010. Along with that the barcode usage in the US continues to expand also in March to total growth of 181.1% within Q1/2011 compared to Q4/2010. US scans grow by 630% compared to Q1/2010. QR codes has been introduced to wider audience in the UK and the Netherlandsthanks to brands such as Heineken, SKY Network, Pizza Express, Grazia Magazine, and Gamma DIY shops, who adopted QRcodes during Q1/2011. Here is one of the fundamental question when it comes to customer behavior and QR code scanning in United States. Why consumers scan QR Codes? When adding QR codes to your marketing campaign, you have to know and understand what motivates people to scan your QR code. Getting coupon, discount or deal and entering a contest or sweepstakes, and getting additional information of the product your are looking at are the top reason for scanning QR Codes. Making a purchase, along with viewing video or connecting on social media are the other reasons for scanning with significant percent of responders. We offer almost all of this QR Code features, and we are working on our own coupon system which will engage users in amazing way. There was significant growth in mobile QR code usage from 3Q2010 to 4Q2010 across many countries. For the first time, the US was the largest country in terms of absolute numbers of scans. It’s important to note that, while smartphone penetration is about 30% in the US, it’s population size makes this large relative to other countries.